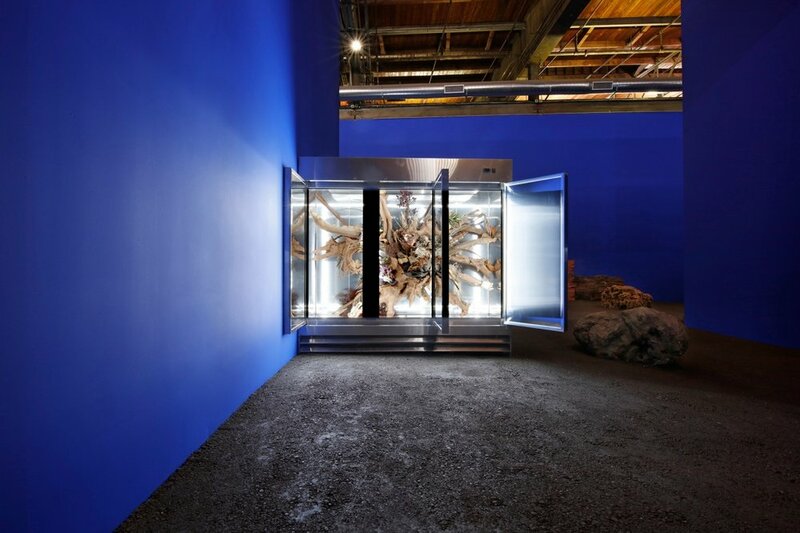 "Adrián Villar Rojas: The Theater of Disappearance" blurs the appearance of time from the past, at the present, and in the future, or it seems to have excavated layers of time from a parallel world. The artist only make specific proposals of sculptural installations and never repeats the same idea at different locations. Villar Rojas became interested in technology used in the Hollywood industry during his local research, so he set up freezers with a mixture of organic and high-tech objects that are seemingly discarded by human beings, which somehow reflect a flavor of cyber punk. The whole exhibition is dramatically different from Villar Rojas's other installation currently showing on the rooftop garden at the MET in NYC (under the same exhibition title), but both of them embody its physical locations' characteristics, history, and cultural landscapes. These sculptures turn exhibition spaces into theaters, opening up silent shows of the appearance and disappearance of time. Image courtsey of Anqi Li. Image courtesy of MOCA Geffen. "What happens at the end of art?" This is a question artist Villar Rojas posits with his post-human artworks. Opened right before Halloween, exhibition The Theater of Disappearance invites you to a raw, mysterious, and thrilling experience.